Is Tigerwood The Right Decking For Your Outdoor Project? One of the most appealing things about Tigerwood is its unique appearance. The boards have some of the most striking color patterns thanks their rich, vibrant, light-brown to orange hue coupled with the dark streaks that run their length. Some trees will feature more of these dark striations than others, but nevertheless they’ll be present. To achieve the most cohesive and appealing look with Tigerwood in your outdoor project, you must do so appropriately and with consideration to the other woods and hues within your deck and surrounding structures. Mixing and matching the boards can either blend the Tigerwood for a more “low key look” or can be used to highlight and make Tigerwood the main focal point. Using Tigerwood as the only wood in your deck will especially allow it to stand-out if you have a solid color in the exterior of your home or pergola. A Tigerwood deck will blend effortlessly if your siding is clear-coated or has light-brown paint. 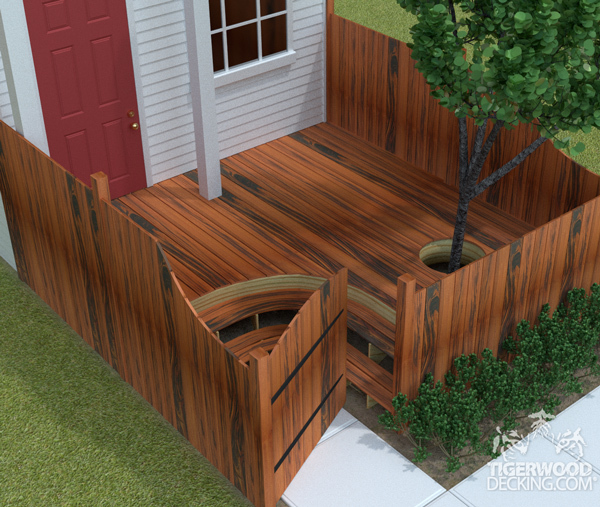 Another way to allow the Tigerwood to stand-out is to use it to frame a deck. This is especially appealing, and allows the Tigerwood to truly be the star, if your deck is made with a darker wood like Ipe. However, framing can also be used to create a beautiful look with a less dramatic contrast if your deck is made of a lighter exotic wood such as Cumaru or Garapa. Finally, if you’re aiming to make the exterior of your house really eye-catching, cover your home’s entire exterior in Tigerwood! You’ll be almost guaranteed to have the most exotic looking house in your neighborhood. If, on the other hand, you simply want to use it as accents, try of using it for window framing or soffits. Your neighbor’s storage pile won’t keep you from enjoying your outdoor area any longer. 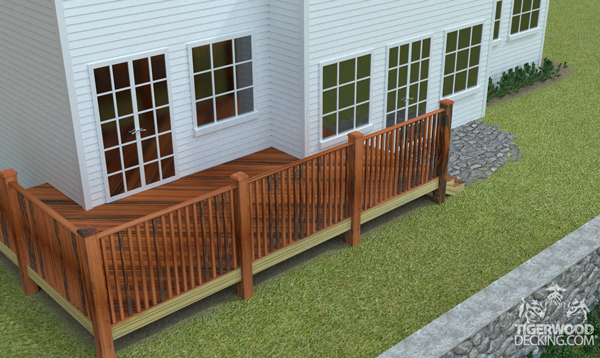 A privacy fence in the same material as your deck will hide the mess and look fantastic. If the edge of your yard happens to be right up against your neighbor’s storage space, it can cause an eyesore. What if your neighbors are too loud and you want to enjoy your deck without hearing their conversations? There are a few options to block the view of that storage pile and to cut down on the noise without causing a feud. Before you get started make sure you are complying with all local building codes. If you are not familiar with decking or fencing installation, contact a local licensed contractor to do the work. A privacy fence is a no-brainer. It’s tall, dense, and will more than likely solve the issue. Build your fence out of the same Tigerwood Decking you built your deck out of. It will add an appealing visual element to the space. If a privacy fence is too much, you can build a fence out of lattice. This will block any view you don’t want to see without making you feel boxed in. Lace the lattice with vines and shrubbery to add an extra design element. We do not sell tigerwood lattice, but we do sell the materials to make tigerwood lattice. No matter which direction you choose to go with blocking that unsightly view, a fence or lattice made of Tigerwood will compliment your deck beautifully. Plus, you can rest assured that the materials that you’re using will last you over 30 years. Contact us today at 1-877-232-3915 for your free quote! 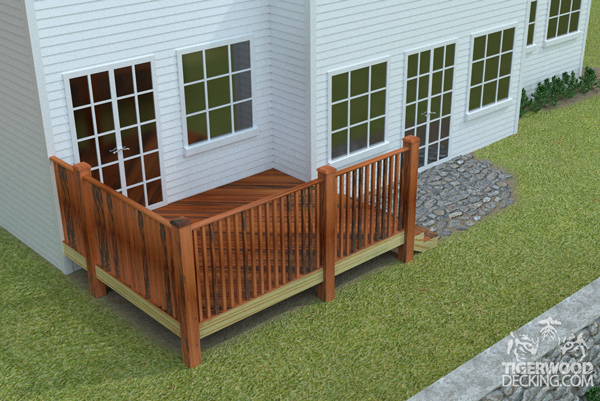 Just because your backyard has a steep slope does not mean you can’t build a deck. Take advantage of the slope and build a multi-level deck! Is your backyard unusable because of a steep slope? Have you given up on what to do with this space? Did you ever think a deck would be possible in these conditions? Use this slope to your advantage and build a deck specifically for your situation. Before you begin, note that building a deck on a steep slope will require a more vigorous installation process with a proper foundation. Leave this installation to the professionals and contact a local licensed contractor that is familiar with building decks on slopes. 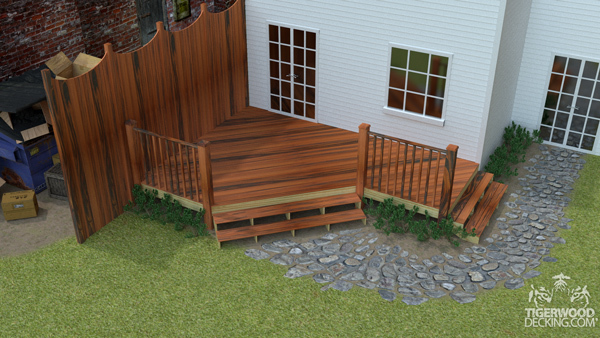 Building a deck on a steep slope can give you a great space to entertain on what was otherwise a waste of space. Depending on the space you have to work with, you can create a multi-level deck that eventually leads down to your yard, or a single level deck that offers amazing views of your backyard. Compliment the design with deck lighting and tigerwood railing. Your deck will surely be the talk of the town. 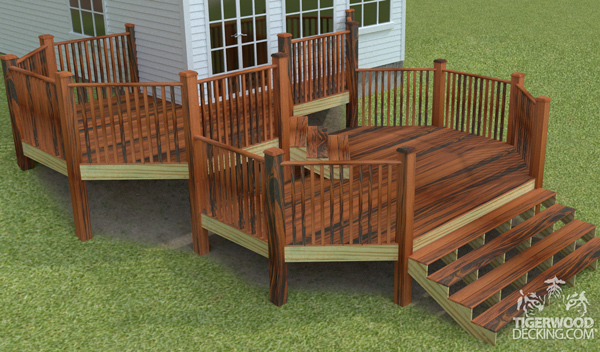 Contact us today at 1-877-232-3915 to get your free Tigerwood Decking quote. You could build a small deck off of the corner of your home. If your home sits on a long, narrow lot, don’t assume the outdoor space you have is unusable. Much like my last post about utilizing all your outdoor space on a narrow lot, the same applies for a long, narrow lot. You do have more of an advantage here as you may have more square footage to work with. Before you get started make sure you are complying with all local building codes. If you are not familiar with decking installation, contact a local licensed contractor to do the work. You have several options when you’re building a deck on a long, narrow lot. You can build the deck to take up an entire corner of your lot. Build some steps that will allow you to access your yard from the deck. Another option is to expand your new deck to take up the entire length of your home. If your lot is narrow enough a deck that takes up the entire backyard won’t be overwhelming when you step outside. Utilize all the space on your lot by making your deck the same length as your home. The last option is to build your deck to wrap around to the front of your home. You can give your guests easy access from the front yard to the backyard when you have those summer BBQs, or fall get togethers. A deck on a long, narrow lot is a possibility; you just have to work with the space you have. If you’re unsure of what you want to build, sit down with a designer. They are experts at building the appropriate structures for their spaces. When you choose a material like Tigerwood Decking, you can be sure that your outdoor space will look stunning. Pair the decking up with some railings and lighting and your backyard will be the talk of the town. Contact us today to get your free Tigerwood Decking quote. The deck of your dreams is a possibility. Deck Dilemma: Can You Build a Deck on a Narrow Lot? Maximize the outdoor space on a small lot by building a deck that’s the same width as the lot. If you live in a city or a neighborhood where the lots are only as wide as your home, you have probably cast off the idea of having a deck. Just because you have a narrow lot does not mean you can’t have an outdoor retreat. When you’re drawing out your plans, use all of your available outdoor space. This means planning for your deck to be as wide as your home. If your neighbors happen to be really close, build a privacy fence out of the same material. To add a little more dynamic, you can create different levels, or even build your deck around a tree. Plus, when that tree matures, you’re left with some added privacy and shade! When you really utilize all of your available space, you will see that your new deck has become an outdoor escape from the urban city. Choosing a material like Tigerwood Decking will leave you with a remarkable outdoor space that is also long-lasting and durable. Tigerwood has a lifespan of over 30 years, making this the perfect option for your new outdoor living area. Split and decayed deck boards need to be replaced immediately to keep anyone from getting hurt. Summer is here which means now is a good time to inspect your deck! Winter brought snow, rain, and ice. When all that moisture sits on old plastic or wood decking, it will soak in, eventually causing splitting or decaying boards. When you inspect your deck it’s important to not miss anything. This includes the ledger board, support posts, joists, deck boards, railings, and even stairs. The ledger board is where decks fail the majority of the time. This is why it’s important to check it. The flashing should be in good condition. Check for mold and loose fasteners. If the ledger seems to be intact, just make sure the fasteners are tightened as well. Puncturing the wood with a screwdriver or ice pick is a great way to see if you have deck board rot. Check for rotted posts. When posts rot, they can’t support weight. If there are any signs of rot or mold, replace the post immediately. Check that all the post connections to the foundation are secure and no soft wood is present. Getting underneath your deck is extremely important. It’s easy to overlook and may be a bit tricky, but with a few extra steps you can rest assured knowing you inspected every inch of your deck. If your decking is on the ground, remove a few boards so you can see underneath. Take a screwdriver and poke the joists and the underside of the deck boards. If the screwdriver penetrates the wood easily, replace the boards. Replace joists as needed. Walk around your deck and inspect each and every deck board, including the stairs, by penetrating with a screwdriver. If the screwdriver goes through, replace those boards. If any fasteners are loose, tighten them. 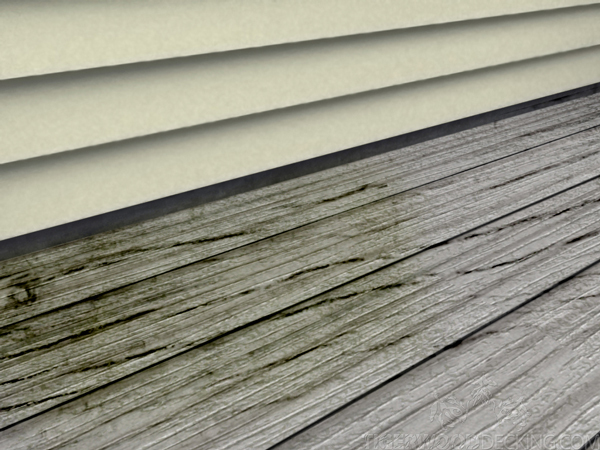 Loose fasteners give moisture the opportunity to enter the deck board and cause rot. Inspect all railings for water damage. If any rot or decay is present, replace the damaged balusters. If you happen to see any split decking, replace those boards. Small cracks can be sanded down and resealed, but if there happens to be a large split on a deck board, be safe and replace the board. In just a short time, you’ll know if any repairs are necessary, and you’ll feel good that you’ve taken the necessary steps to have a safe deck. Don’t rush through the process, and contact a local licensed contractor if you are unsure what to look for. When you’re flashing starts to deteriorate, it’s time to replace it. Flashing is a metal or plastic material used as a barrier in moisture sensitive areas. It’s usually found on the ledger board, but just because flashing is present it doesn’t mean it’s doing its job properly. Inspect the ledger and the flashing to see if it’s damaged. Look for the obvious: decayed, soft, or rotted wood. Are there any spots where water is collecting? What about the fasteners? Are they free of corrosion? Are they even the proper fasteners? If you inspect your ledger and see it’s not in the best shape, it’s critical you replace the it and install new flashing. Ledger board failure is the leading cause of deck collapses. Replacing a ledger can be a difficult task, which is why it’s important to contact a local licensed contractor to do the work. If you want to go the extra mile with flashing and add a few more years to the life of your deck, consider adding flashing to the joist system. 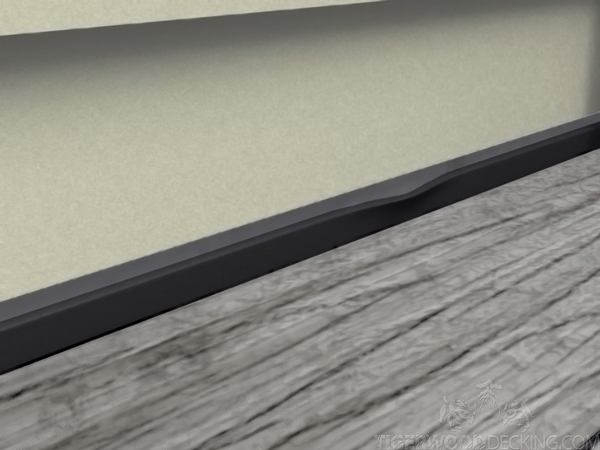 A ledger board without the proper flashing is just a disaster waiting to happen. Inspecting for such issues will save you from a horrible accident, such as a deck collapse. Do NOT let your railings get like this. 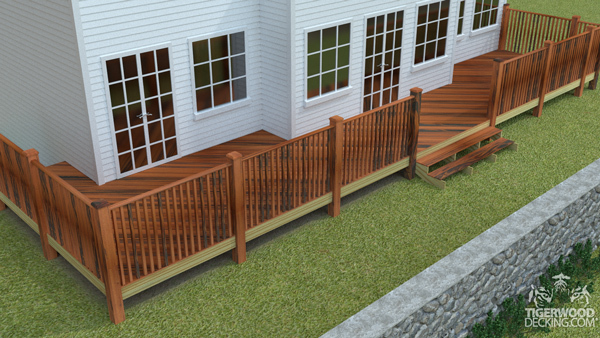 Did you know that deck handrails are required to have no more than 4” between each baluster? This code was put in place because when balusters are more than 4” apart on center, it becomes a safety hazard. Go measure the distance between your balusters right now. Are they more than 4” apart? Are the railings less than 36” high? If so, your deck is closed. If an inspector were to come by your home, you’d be hit with a fine. 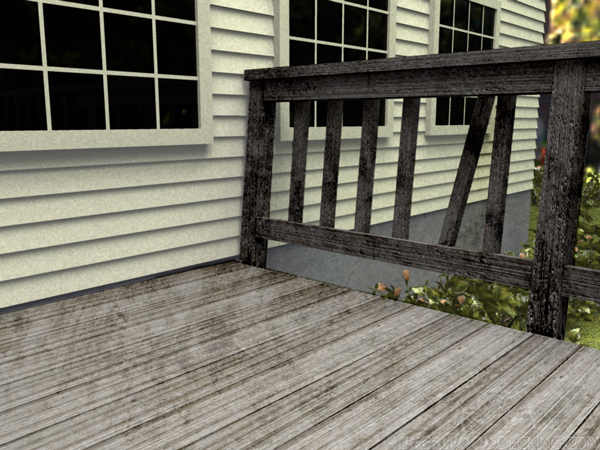 If your deck is more than 20” off the ground, most local building codes require you to have a secure railing present. I say “most” because it varies from city to city. Do your research for your local area before starting any deck project. Call a local licensed contractor if you are unsure about this type of installation. Walk out on your deck and give the railing a good shake. If there is any give, it needs to be replaced or repaired. Sometimes securing the fasteners and replacing corroded ones is all you need to do. Like I said before, balusters should not be more than 4” apart on center. This is so a pet or child wont slip through the railing. The higher the decking is off the ground, the more crucial this becomes. Rotted railings and balusters are another weak spot that could cause someone to fall through without warning. Replace these immediately. As always, check with your local building codes to ensure your deck and railings meet the proper requirements. When you have safe and secure railings, it gives you one less thing to worry about during the summer, and allows you to enjoy it to its full potential. Deck Safety: Check Your Stairs! Stairways can be easily overlooked, but they need just as much attention as your decking. During the summer, you’re going to spend a lot of time outside. This is why now is the best time to check your decking and stairs. After you’ve checked for loose/corroded fasteners and split/decayed wood, be sure to inspect your stairs. 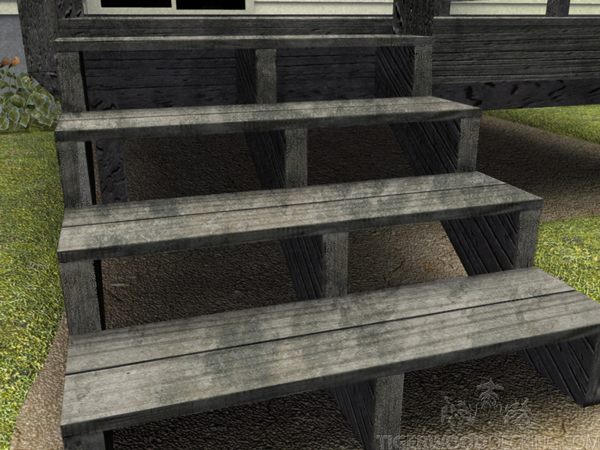 If you’re unsure about the safety and stability of your deck and/or stairs, DO NOT WALK ON IT! Contact a local licensed contractor familiar with this type of installation. As mentioned before, checking for loose and corroded fasteners is necessary to make sure your deck is safe, but don’t forget your stairs! Replace any corroded fasteners, and use stainless steel replacements. Tighten any loose fasteners. If you see that any part of your decking is held together with just nails, replace them immediately with the proper fastener. Do not set foot on your deck until you’ve completed your inspection. Shaky or deteriorated railings are dangerous. If you find your stairway has railings that are insecure or decaying, it’s crucial to replace them immediately. If the stringers and risers are not in superior shape, they need to be replaced. Check your measurements as well. If your stairs are open in the back, most local building codes require the distance between each stair to not exceed 4”, and standard stair runs are 11”. It’s also advised not to leave anything on the stairs that could pose a tripping hazard, such as potted plants or children’s toys. Checking for issues now will save you from potential accidents, and will leave you with a carefree and safe summer! 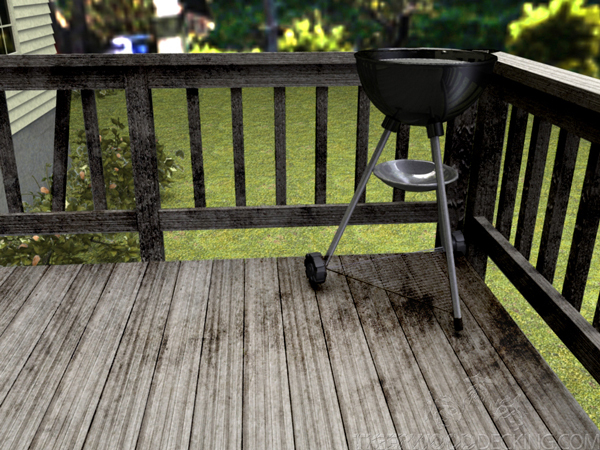 Hot charcoal can ruin your deck. Make sure you are using your grill correctly. It’s critical to be educated in fire safety before you entertain guests at your next deck party. According to the United State Fire Administration (USFA), in 2012, there were an estimated 5,700 grill fires on residential properties. Knowing how to set your deck up for safety can prevent a disastrous accident from occurring. Here are some tips that will help improve the fire safety of your deck. Make sure your grill is a safe distance away from siding, railings, soffits, and overhanging branches. Designate a spot where the grill is out of the way of foot traffic. Teach children about a “safe zone” away from the grill. Empty the grease trap. Hot grills can ignite it at any time. Use a flame retardant matte under and around the grill. As always, you should have a fire extinguisher on hand for any accidents, and always follow all manufactures’ instructions. If you are using a charcoal grill, and it gets knocked over DO NOT PICK UP THE CHARCOAL WITH YOUR HANDS! Charcoal is designed be burn at 600ºF for about an hour and in some cases the coals can reach up to 1000ºF. Fire pits are a great way to enjoy summer nights. However, the increasing popularity of these over the years has also raised concerns. When used properly a fire pit can be the perfect addition to your outdoor space. Keep flammable materials and fluids away from the fire. Do not attempt to relight a fire with any flammable liquids. Teach children about fire safety, and encourage them not to play around open flames. Only use approved materials in fire pits. Items such as paper, leaves, or soft woods like pine and cedar can pop and throw sparks. Just like with a grill, make sure you have a fire extinguisher on hand, and follow all manufactures’ instructions. If a fire is started and gets out of hand, DO NOT ATTEMPT TO PUT IT OUT. Call the fire department immediately and get everyone off the deck and away from the fire. Do not attempt to retrieve any items from your deck. Safety is the most important. Sue on What Makes Tigerwood a Solid Choice for Any Climate? Tigerwood (Also known as: Goncalo Alves, Brazilian Koa, and Muiracatiara) is one of the finest quality exotic hardwoods available that offers a 30+ year lifespan without preservatives!